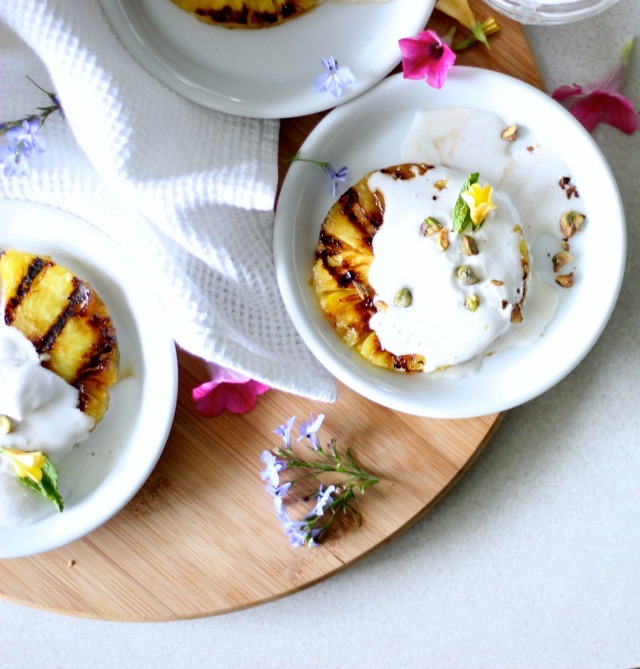 This weekend I took to the kitchen to make an elevated version of a summertime childhood favourite dessert: pineapple and cool whip. 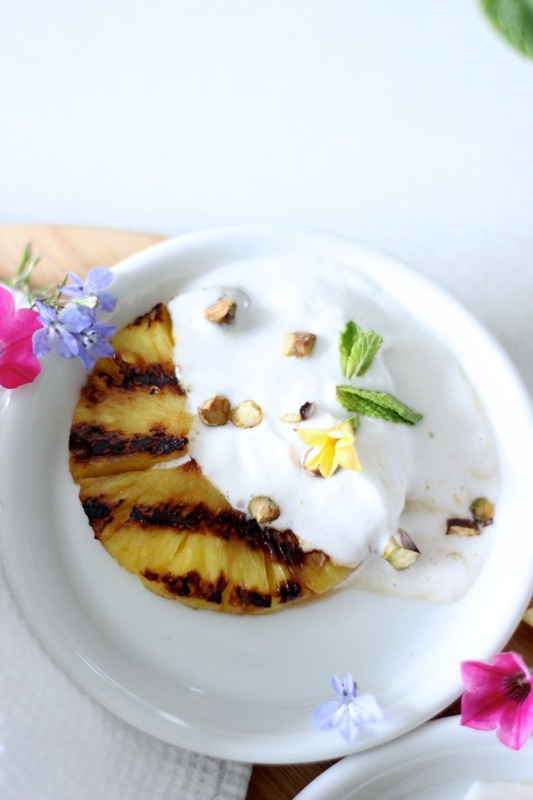 When I was younger my mom would cube up some pineapple, spoon some cool whip on top and I would devour it within minutes, and even drink the juice at the bottom of the bowl! A perfect way to beat the heat as it's chilled and refreshing, oh, so quintessentially summer time appropriate. We got to talking about the dish just last week and how I hadn't had it in years! Our conversation had my tastebuds hankering for the sweetly refreshing treat. As a healthier alternative to cool whip I tried my hand at coconut whip. Wow-- can I just say this is the simplest thing to whip together (literally)? The can of coconut milk needs to chill in the fridge for at least 24 hours, but once it's chilled it takes mere minutes to put together. All you do is chill the can, open it from the bottom, drain the liquid on top and, using a hand mixer, whip the (hardened) coconut milk with some agave and vanilla extract. 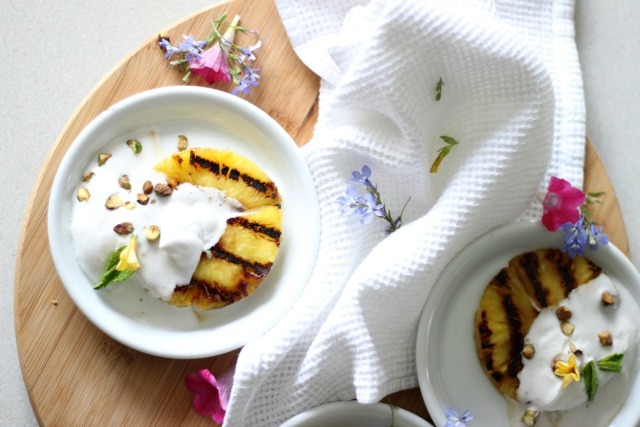 Once your BBQ is hot the whole dish literally takes 5 minutes to throw together-- throw some pistachios in the oven, grill the pineapple, spoon on the whip and there you have it. Coconut whip is probably my new favourite thing. Eat it with berries, add it on top of smoothies, or devour with a spoon, it's just too good! 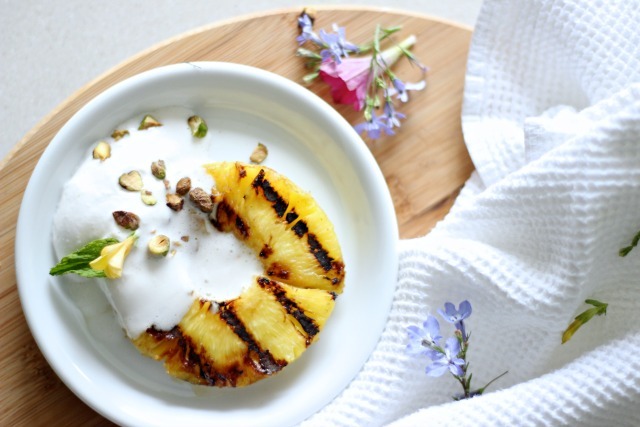 And grilled pineapple?! Well, that was also a first for me also, and it was divine! So juicy but the little bit of BBQ char gives it a nice touch. If that isn't your thing feel free to leave out the grilling and serve your whip on a bowl of mixed fruit and berries. It's equally as delicious! 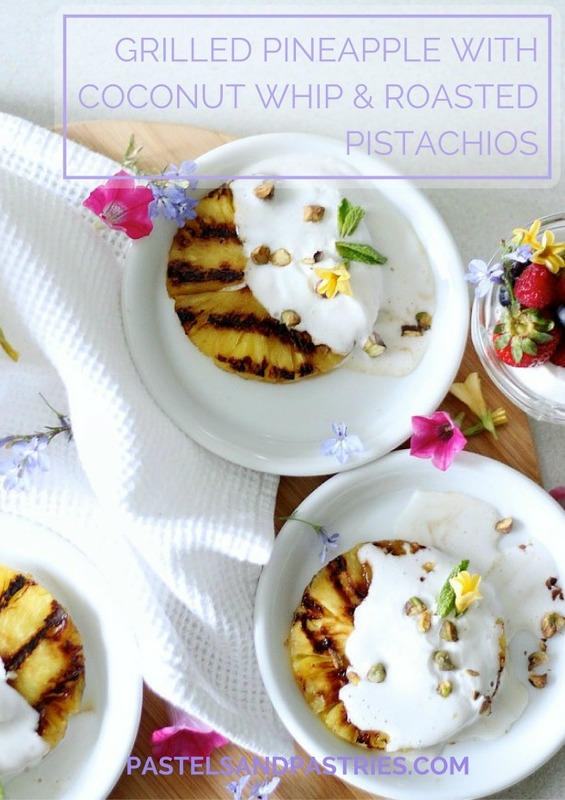 Don't leave out the pistachios! 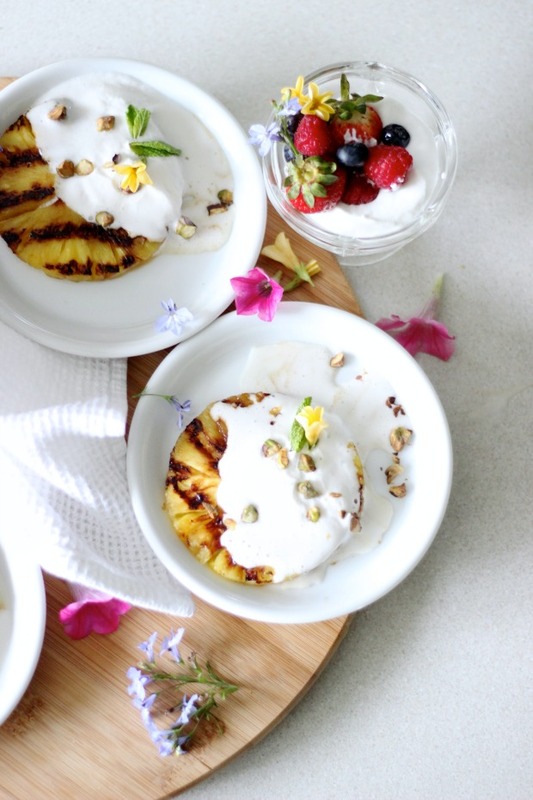 They really add such a nice crunch to the dish and work so well with the sweetness of the pineapple. The dessert brought me right back to my childhood and I can't wait to whip it up (literally, again) all summer long! The coconut whip will last in an airtight container in the fridge for about 5 days. Try out this dish! It's perfect for summer entertaining. Your guests will love it and how could you go wrong with dessert that takes 5 minutes? And let me know, what were some of your favourite summertime desserts as a child? YUMMY!!! This looks delicious! Can't wait to try for myself! That looks SO good! 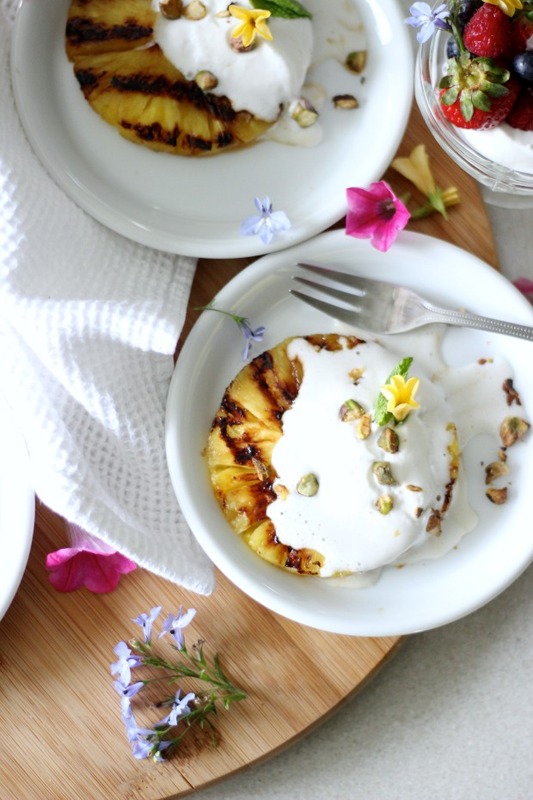 I've never tried coconut whip, but it sounds so easy! It's so easy. And SO delicious!